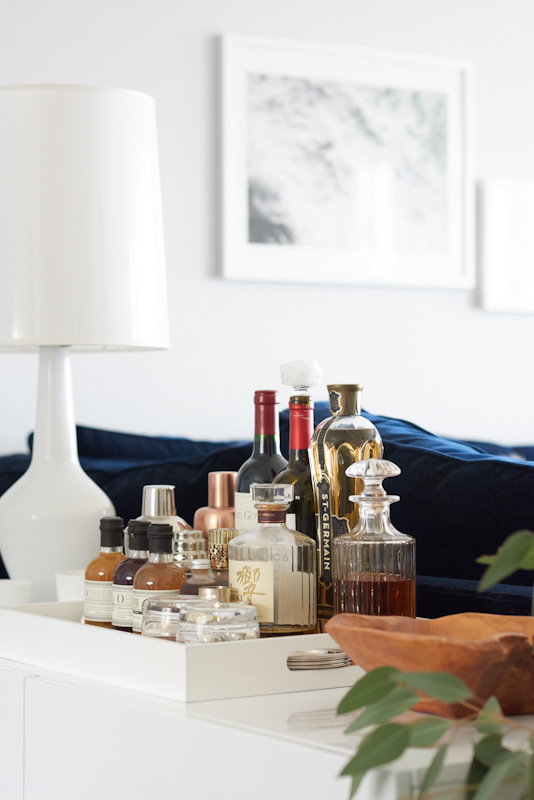 You know those people who can scan any store—be it high-end boutique or affordable standby—and pick out the perfect mix of items (many of which you totally missed)? That would be Jeanne Chan. 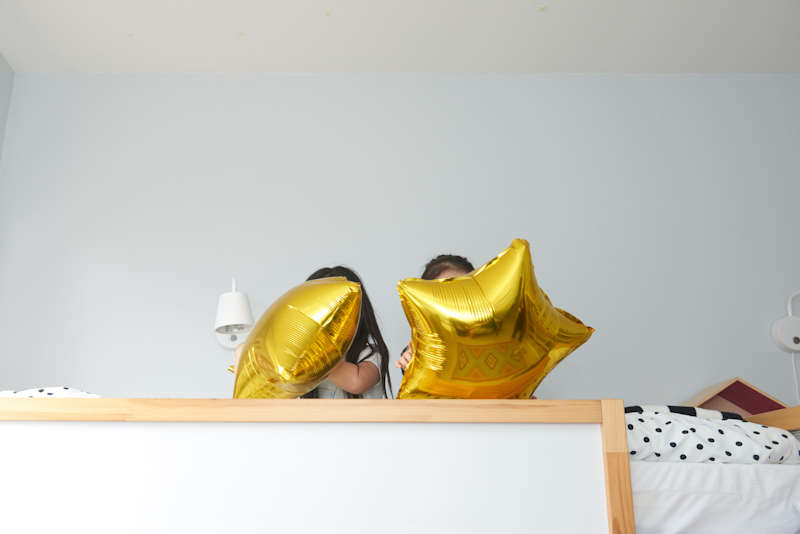 Luckily, on her Instagram feed, via Snapchat, and on her lifestyle blog Shop Sweet Things, the mother-of-two lets us in on a lot of her secrets. 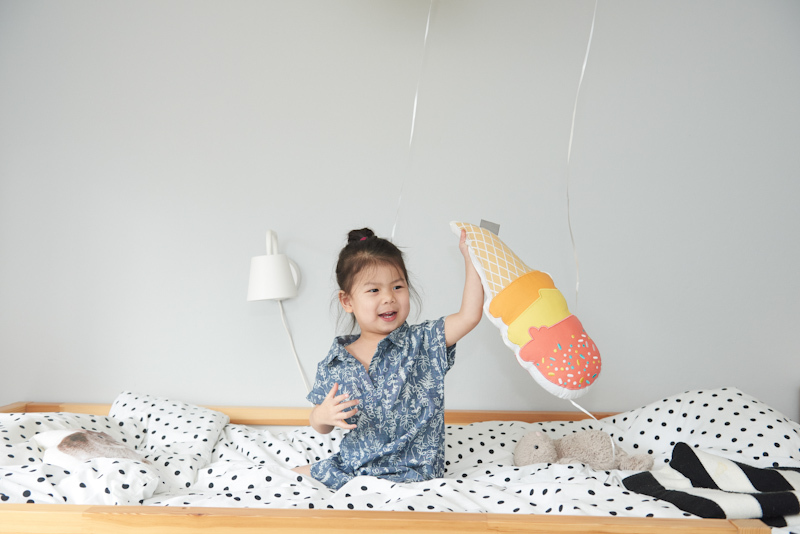 And with her partywares company, Harlow & Gray, on the way, she’s helping everyone upgrade everything from baby showers to 1st birthday parties in a snap. 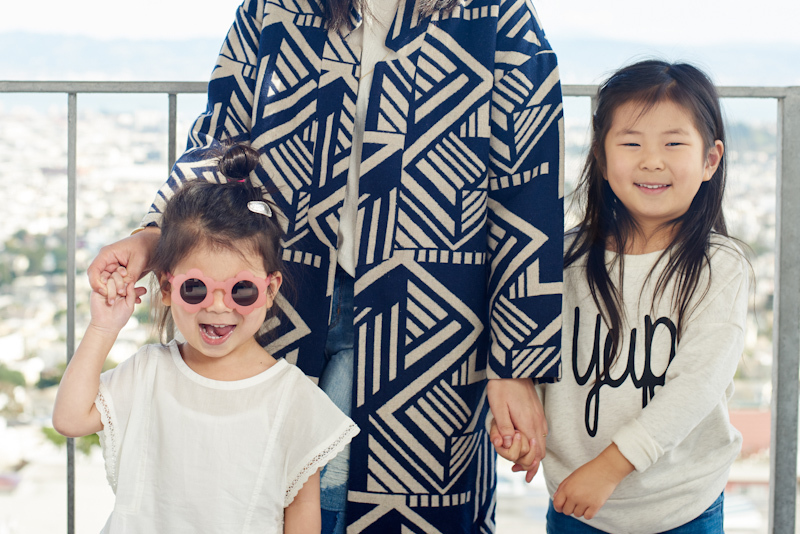 All the while, she’s outfitting her adorable mini-me daughters (Hayden, 5, and Hadley, 3) in the most adorable match-game ensembles. 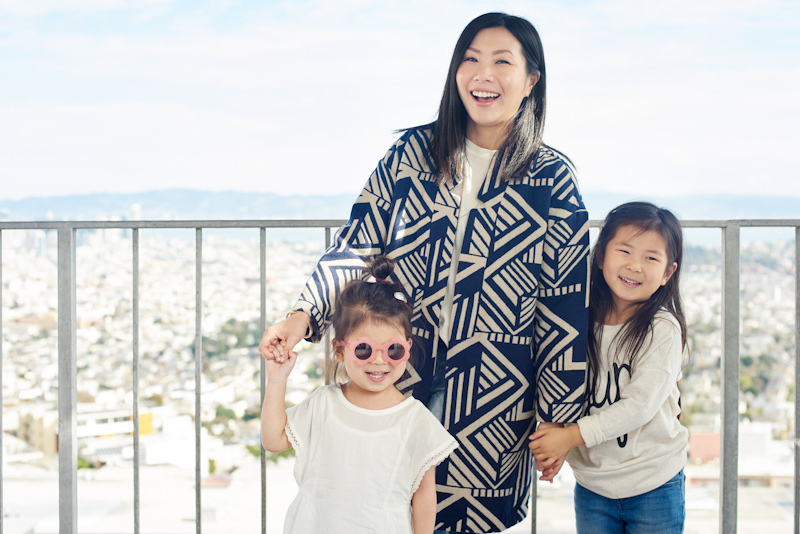 Here, we asked her to cherrypick her favorite pieces from Old Navy‘s current kids’ and women’s arsenal—shibori jumpsuits, patchwork denim, and a must-buy graphic-print overcoat, included—while she shows us around her expertly curated San Francisco home. 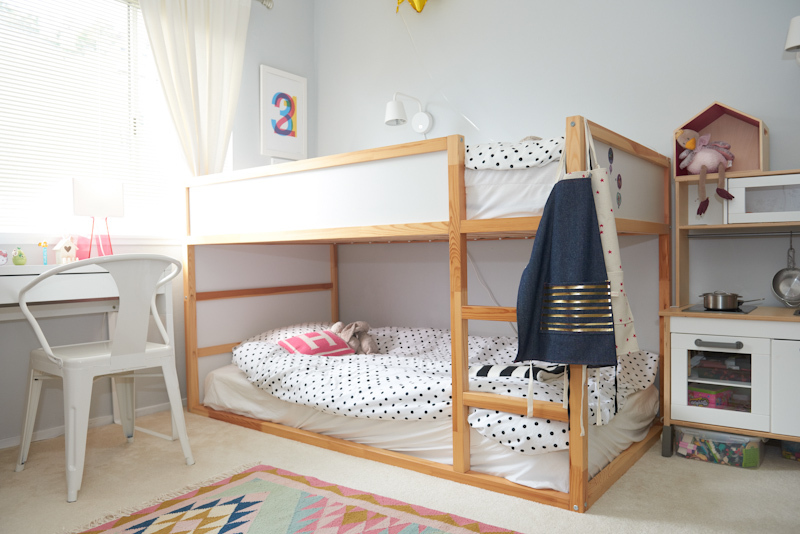 "We’ve been living in our two-bedroom apartment for six years now. My relative was living here for ten years before she moved out. Right after, we snagged it because we were expecting our first baby and needed room to grow from our one-bedroom. 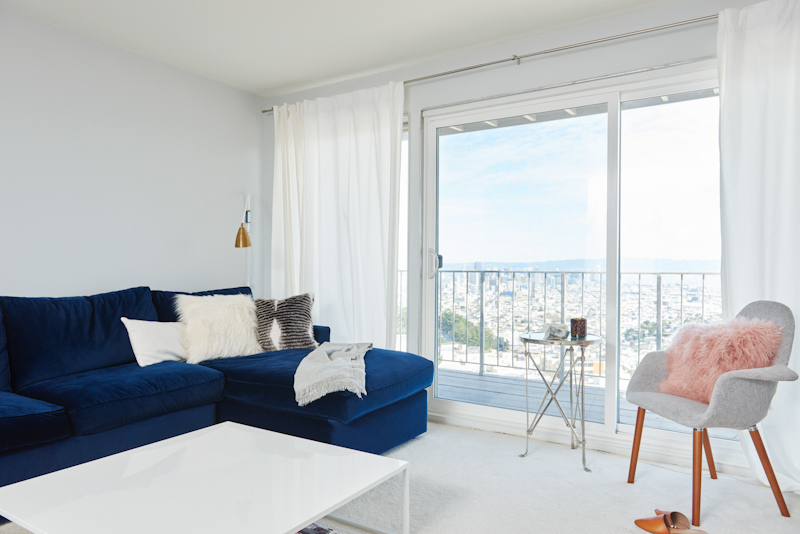 We love that it offers a stunning view of San Francisco." Jeanne wears a Long Open-Front Cardigan, $24, Old Navy and a Sleeveless Button-Front Jumpsuit, $17.50, Old Navy. 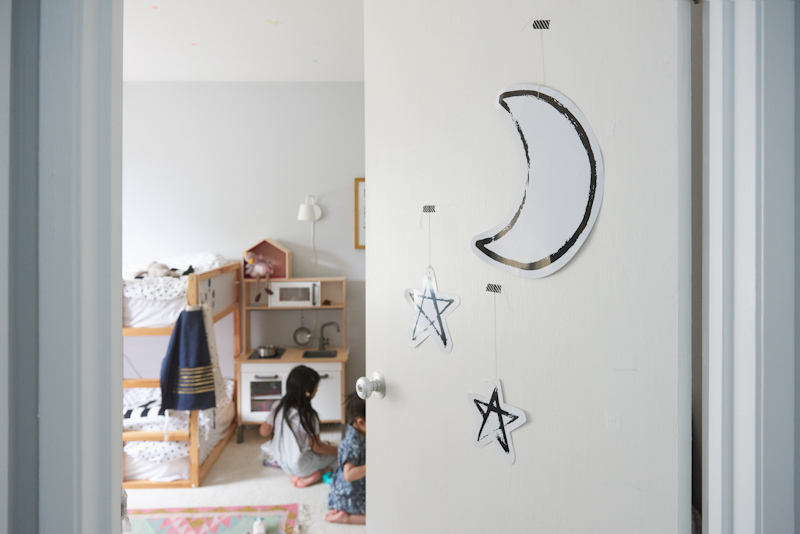 A peek into the girls' space. "Modern, collected, and slightly eccentric." "Not following too many rules. 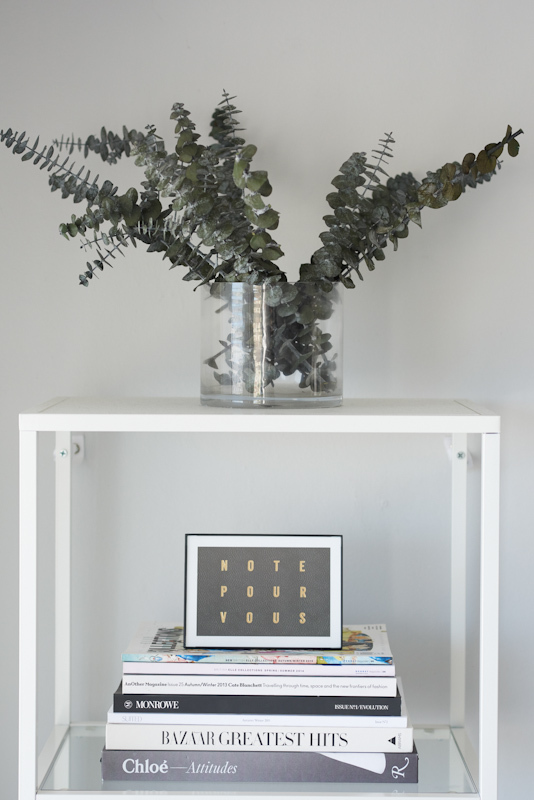 I once had a chance to interview Nate Berkus and what he said to me really struck a chord: 'The best rooms I’ve seen and done is when the client really lets go, not thinking what is supposed to be appropriate for that particular room.' I also began to learn that decorating a home is a process. 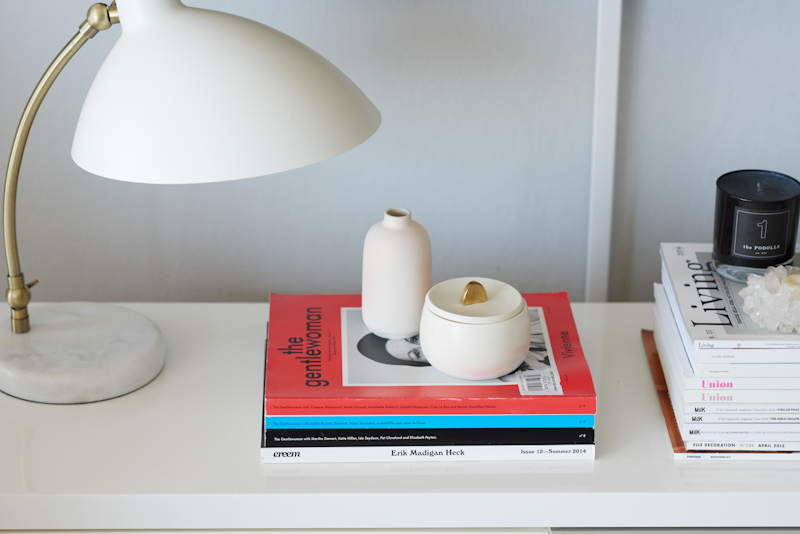 After reading Sage Living, I started to accept that creating a home that feels authentic and real takes time. I used to rush my decorating just so that my home feels complete, but all I ended up with was a perfectly staged home." Hadley wears a Floral Chambray Pullover Dress, $10, Old Navy. 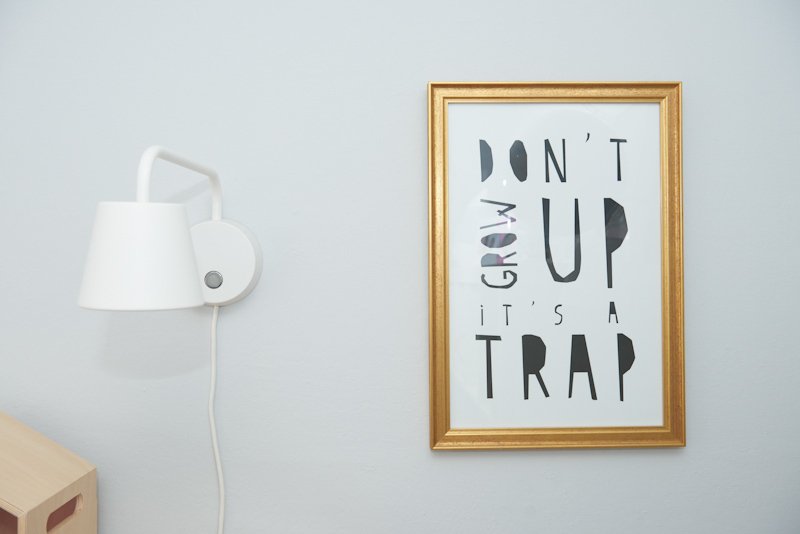 "I was just going through Hayden’s first born pictures and was thinking how clean and minimal her bedroom/nursery was. 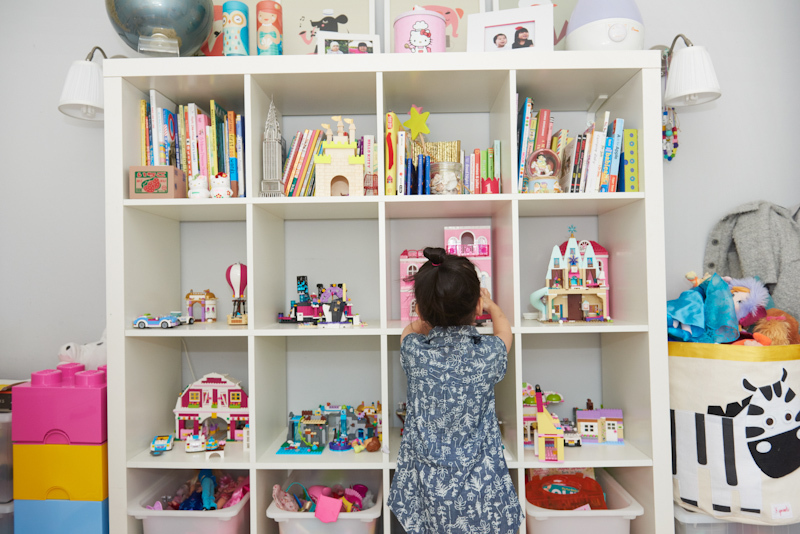 Now it’s filled with all her and her sister’s favorite belongings from Barbies to Legos, to books and puzzles. I love seeing how it evolved." Hadley wears a Floral Chambray Pullover Dress, $10, Old Navy. Hayden wears Denim Overalls for Girls, $30, Old Navy and a Tulip-Hem Tee, $10, Old Navy. Jeanne wears a Long Open-Front Cardigan, $24, Old Navy and a Sleeveless Button-Front Jumpsuit, $17.50, Old Navy. 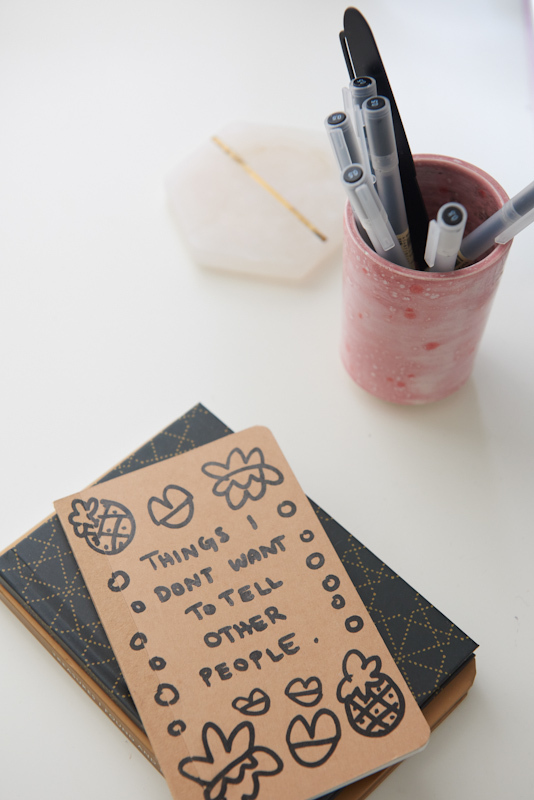 "Hayden is an artist, so her favorite thing in the room is a collection of notebooks of her own drawings. Hadley still sleeps with me, so she thinks my bedroom is her bedroom and her favorite thing is my bed!" Hayden wears Denim Overalls for Girls, $30, Old Navy and a Tulip-Hem Tee, $10, Old Navy. Hadley wears a Floral Chambray Pullover Dress, $10, Old Navy. "I love the tufted, pale blue antique chair that I got for a really good deal. 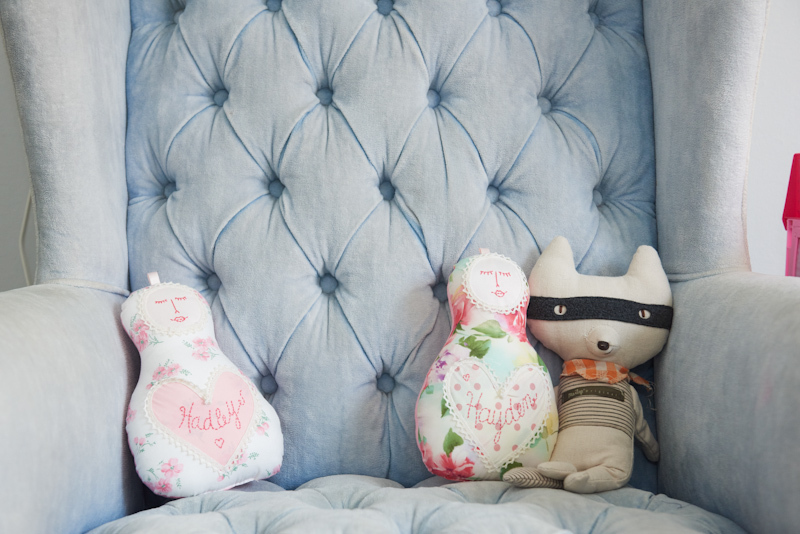 It’s big and comfy and when it’s not covered in stuffed animals, I love sitting there to watch them play." 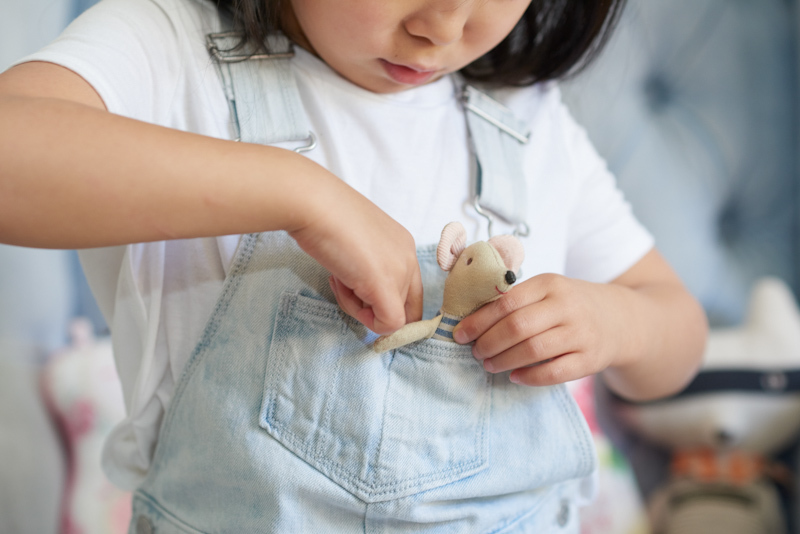 "There’s no such thing as keeping toys corralled with active children in the house. My kids are at an age where they like to build forts and obstacle courses and play camping around the home. 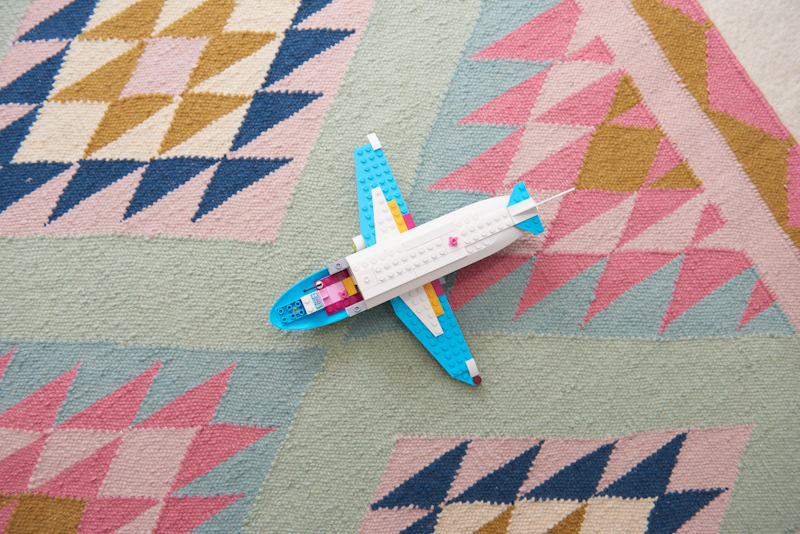 Since we don’t want to limit their imagination, we let them take over the space. What we do is that we enforce clean-up time as a family before bedtime. 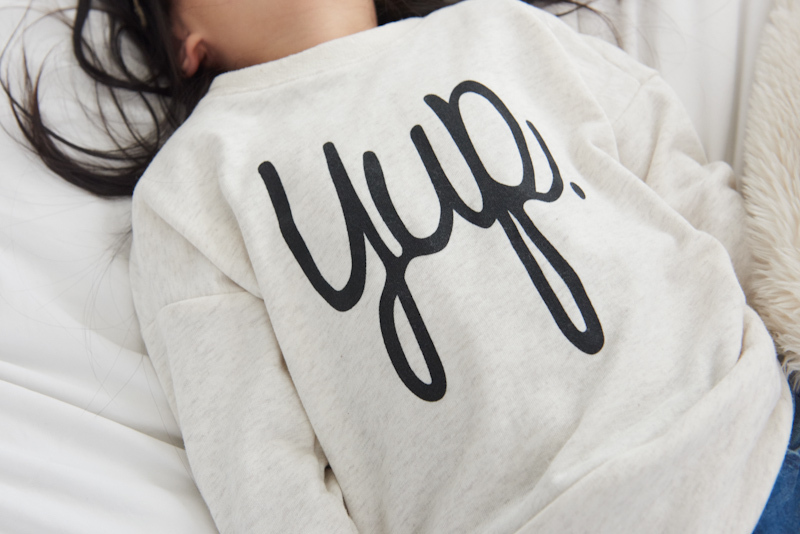 It doesn’t always happen, but I’ve learned to let go and deal with it in the morning." "Some of my favorite art works are by Max Wagner, Heather Day, and Dan Garzi. 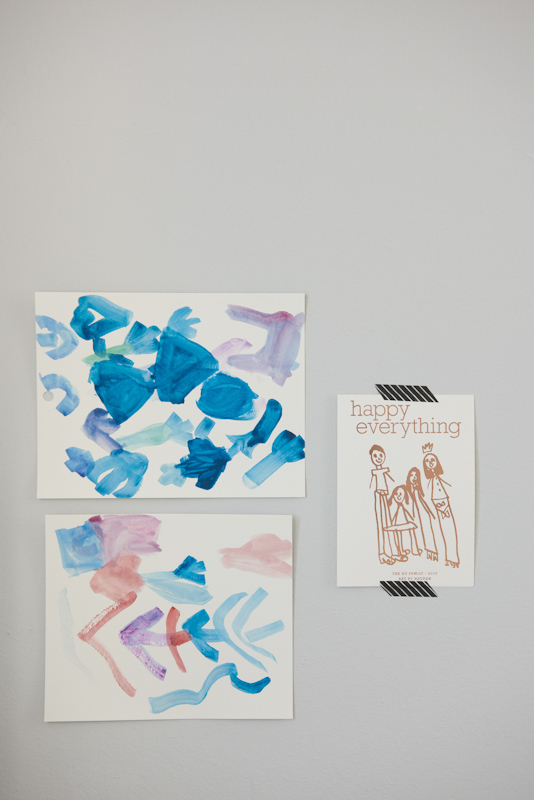 I also love a few treasured pieces from Minted, Tappan Collective, and of course my kids’ art! Furniture wise, I love our sofa! 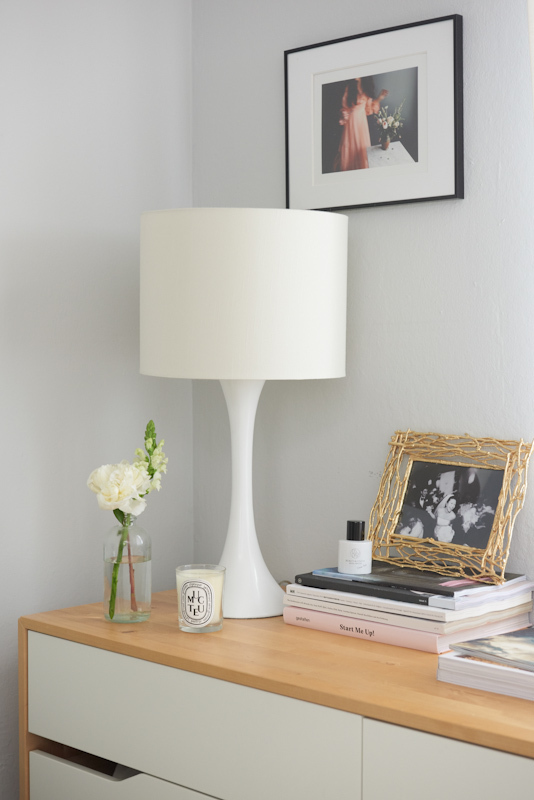 It’s one of the best investment pieces I got from Room & Board. 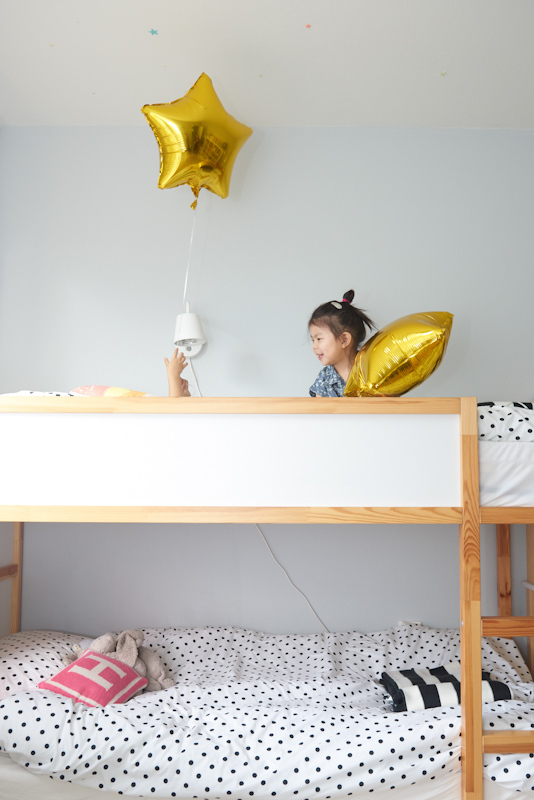 My kids run and jump on it all the time and it’s been holding up really well and we spend a lot of family time together on it." Floral Chambray Pullover Dress, $10, Old Navy. "I’m much less self-centered and I don’t let the little things get to me anymore. I also developed a compassion for mothers in a way that I never had before. I don’t know if there’s anything bad, but if I have to name one thing, it’s probably the ease of doing anything spontaneous such as an outing with friends, date nights, or traveling. It’s often confined by my kids' schedule. It’s not that I don’t do these things anymore, but there’s just more planning involved. Dinner with friends can take a month to schedule." "That I can actually take care of another human being beyond myself. And how comfortable I am with my body." "For Hayden Madison, I wanted a H name because it would sound nice with her last name, and I’ve always liked unisex names. That narrowed it down a bit and Hayden just sounded right to my husband and I. Hadley Annabelle followed her sister’s footstep with a unisex H name. I drew her name from a famous interior designer, Albert Hadley. It had a nice ring to it and it stuck." Denim Overalls for Girls, $30, Old Navy and a Tulip-Hem Tee, $10, Old Navy. Perfect home for a little mouse. "The unconditional love I get. It’s the most genuine feeling in the world. I hope that stays true when they become teenagers!" Jeanne wears an Oversized Gauze-Front Shirt for Women, $18, Old Navy; Drawstring Tapered Cropped Pants, $25, Old Navy; and Patterned Gauze Scarf, $13, Old Navy. Hadley wears a Printed Capri Jumpsuit, $14, Old Navy. Hayden wears a Graphic Printed Jumpsuit, $20, Old Navy. "Receiving bad phone calls. One of the most nerve-racking calls I received was that Hadley was in a car accident." Hadley wears a Printed Capri Jumpsuit, $14, Old Navy. Hayden wears a Graphic Printed Jumpsuit, $20, Old Navy. 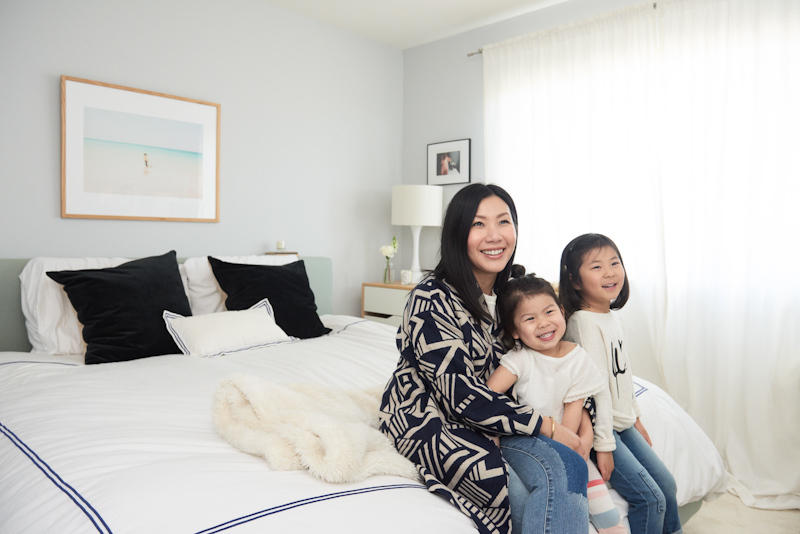 "That the attention is no longer focused on one kid and to also keep up with the quality of life in S.F." Printed Capri Jumpsuit, $14, Old Navy. Graphic Printed Jumpsuit, $20, Old Navy. 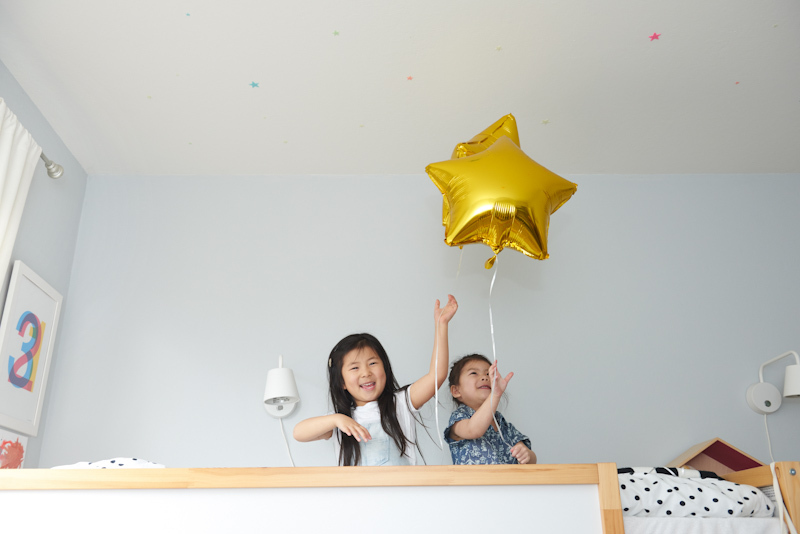 "We eventually found a rhythm on how to manage two kids. It’s not easy, but reading up on parenting advice and tips from family and friends helped. As for quality of life, we may not be able to dine out as often as we like, but we compensate by being more creative with our recipes and making more interesting meals at home during the weekend." "Yes, but it’s hard to schedule a full day away from one kid, so I will try to take Hayden out for something small like frozen yogurt or a grocery trip with mommy. As for Hadley, I will take her to a bookstore or she will just be happy hanging out with me at home, eating ice cream." "They just get each other. Hadley will say something gibberish that neither my husband nor I understand, and Hayden will know exactly what her sister is talking about. It’s like they have their own language. The bond that they have is beyond words and it makes being a mother of two so worth it." "Open communication with your partner is key, and staying intimate. Don’t be afraid to hug or kiss or hold hands in front of your kids, even if your kids look at you funny! I think it’s important for my kids to know that my husband and I are in love and care about each other. As a couple, my husband and I have also learned to appreciate the little gestures more than the big ones, like dinners and gifts. A few encouraging words from my husband is more than anything money can buy." "They’re very different. Hayden is very sweet, happy, and calm, while Hadley is more mischievous, sassy, and loud. One thing they have in common is that they both have big hearts. I think Hayden is very similar to my husband and I, in that we are both have very calm and even-keeled. We have absolutely no idea where Hadley got her traits from, but she is definitely the clown in the family." Jeanne wears an Oversized Gauze-Front Shirt for Women, $18, Old Navy; Drawstring Tapered Cropped Pants, $25, Old Navy; and Patterned Gauze Scarf, $13, Old Navy. Hadley wears a Printed Capri Jumpsuit, $14, Old Navy. "For celebrity moms, I’m kinda loving Ivanka Trump and Jessica Alba. Maybe because I’m a growing entrepreneur and can relate to their stories and motherhood lives. And while their profiles are glamorous, I do love how they embrace motherhood in a very authentic way." Oversized Gauze-Front Shirt for Women, $18, Old Navy and Patterned Gauze Scarf, $13, Old Navy. "Life will be very different no matter how well you think you’ve planned it. 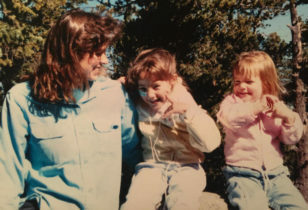 You may have an ideal picture of how you want your family to be, but there is no prediction how your child will behave and what works or doesn't work with your family. Be open and be flexible. Nothing will test your patience and marriage more than having kids." Chambray Slip-On Sneakers for Girls, $19.94, Old Navy. Butterfly Cut-Out Sandal for Baby, $14, Old Navy. "I have a few, but I never get through any of them! Right now, I mostly rely on parenting sites like Mother, my moms group, or trusted friends and family for advice." 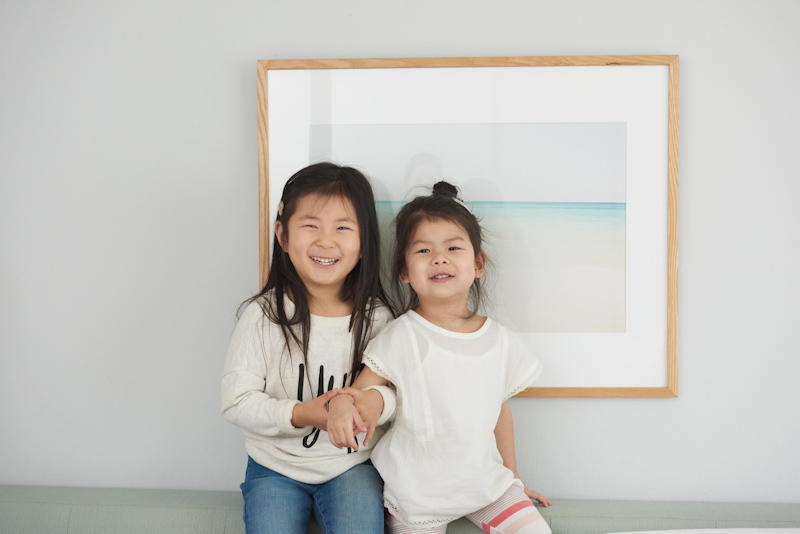 "A slow morning at home having breakfast together, then head out to a neighborhood park and lunch, then early dinner at home and hopefully catch a family movie together before bed." "I think it’s hard to label myself with a particular style because I'm very open to trying new trends. But overall, I’m attracted to pieces that are polished, understated, and can convey a little edge. My staples are a well-fitted overcoat, skinny or boyfriend jeans, and a pair of cool sneakers, flats, or booties." Hadley wears a Lace-Trim Top for Baby, $15.99, Old Navy and Flower-Shaped Sunglasses, $5, Old Navy. Jeanne wears an Open-Front Patterned Coat, $50, Old Navy. Hayden wears a French-Terry Cocoon Top for Girls, $22, Old Navy and Cuffed Patchwork Skinny Jeans for Girls, $20, Old Navy. 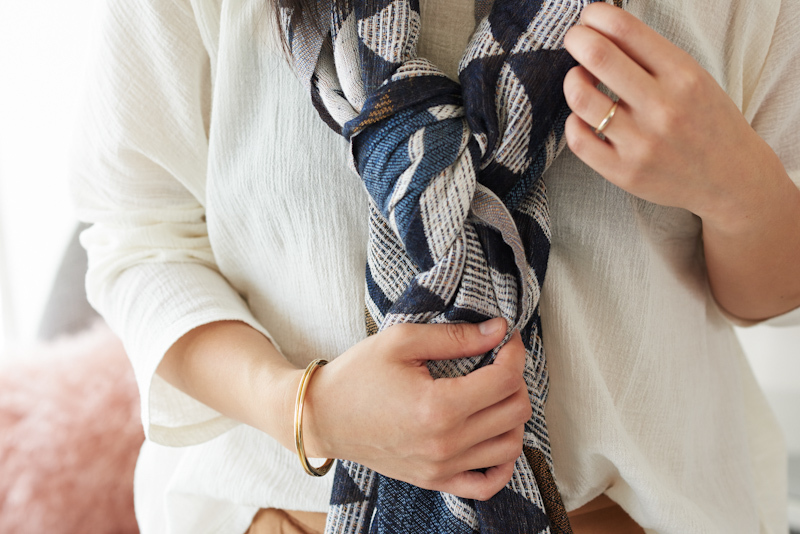 "Not so much on the style, but more about how it fits and how it makes me feel. I no longer buy pieces that I’m unsure about or buy things just because they're on super sale. I’m definitely more conscious about what goes into my closet and to pick key pieces that would complement the rest of my wardrobe." "I shop online only if I’m familiar with the brand and that it offers consistent sizing and has a generous shipping and return policy. But I still like to shop in person because I feel like I can often spot pieces I wouldn’t find online, especially in specialty boutiques. 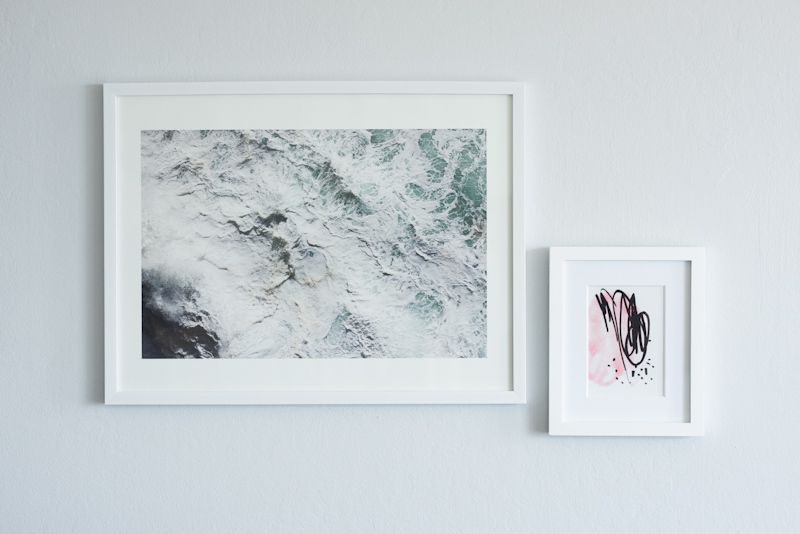 And some pieces you just want to try in person before purchasing." Hadley wears Jersey Leggings for Baby, $6, Old Navy and Butterfly Cut-Out Sandal for Baby, $14, Old Navy. Jeanne wears Women's Mid-Rise Rockstar Patchwork Jeans, $29.97, Old Navy and Pointed Flat Fashion Mule, $24.94, Old Navy. 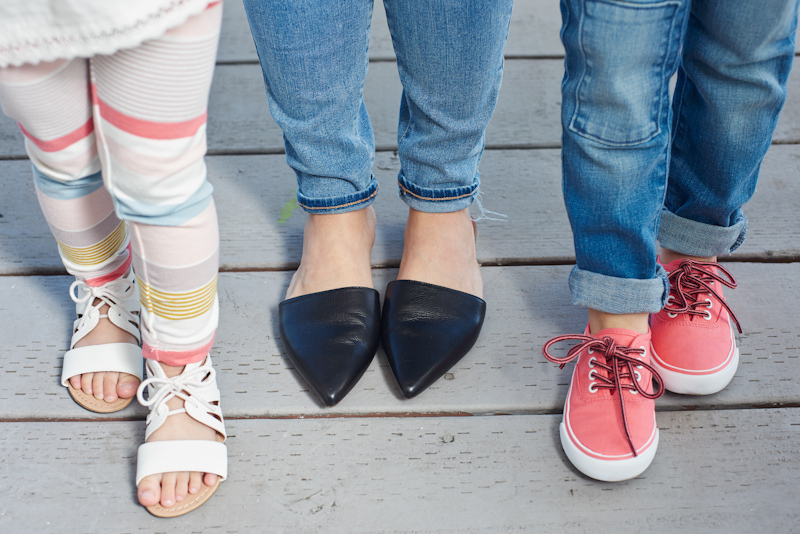 Hayden wears Cuffed Patchwork Skinny Jeans for Girls, $20, Old Navy and Canvas Sneakers for Girls, $15, Old Navy. 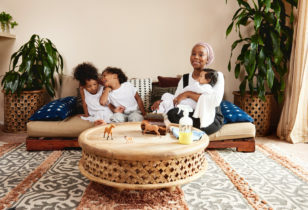 "My beauty routine has simplified a lot after kids, which I actually really like. On most days I wear minimal make-up. What takes me an hour before only takes me 15 minutes now. I pay more attention to my skincare routine and I visit my aesthetician, Kimmy Williams of AES, every 4-6 weeks. I started an acne bootcamp with her and now I’m on a really effective skincare regimen that allows me to achieve clear and healthy skin. On special occasions and events, I still like to wear my orange lipstick or put on some smokey eyes." Hayden wears a French-Terry Cocoon Top for Girls, $22, Old Navy and Cuffed Patchwork Skinny Jeans for Girls, $20, Old Navy. Hadley wears a Lace-Trim Top for Baby, $15.99, Old Navy and Jersey Leggings for Baby, $6, Old Navy. Jeanne wears an Open-Front Patterned Coat, $50, Old Navy; an Oversized Gauze-Front Shirt for Women, $18, Old Navy; and Women's Mid-Rise Rockstar Patchwork Jeans, $29.97, Old Navy. "I think this is the hardest part for me to get down. 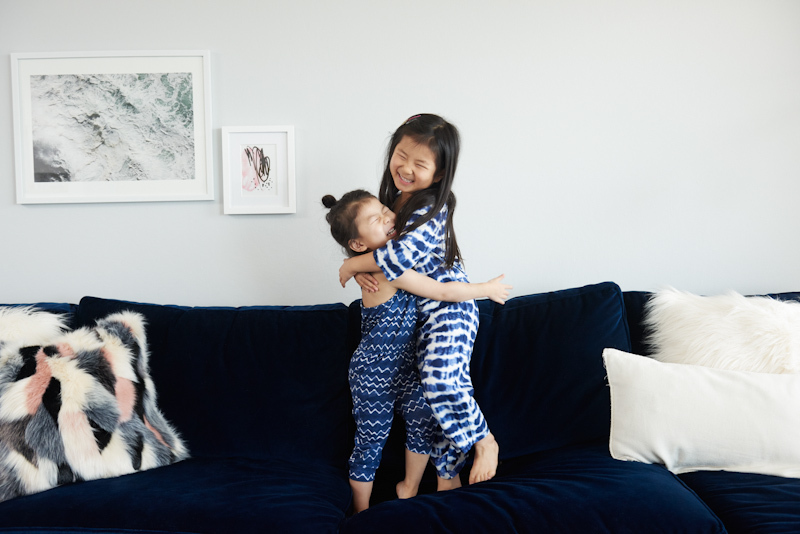 Between my soon-to-launch company, Harlow & Grey, to shuttling kids to school, and keeping up with family lives, I can hardly squeeze in time for a workout or time for myself. It’s something I’m working towards, but when I do have a few minutes I meditate using Headspace or I jump rope and do stretches at home." Lace-Trim Top for Baby, $15.99, Old Navy and Jersey Leggings for Baby, $6, Old Navy. 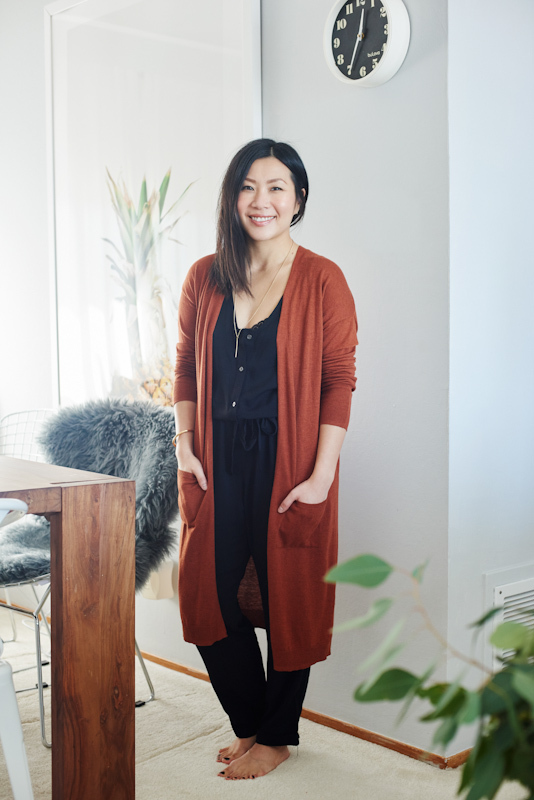 "For the past few years, I've been creating editorial and social media content for my lifestyle blog, Shop Sweet Things. About two years ago, I also began working on a new business venture with my cousin, it's a line of modern partyware called Harlow & Grey. The process has been a long one. From ideation to business planning to manufacturing, we’re finally launching in a month. It’s something I’m very proud of and I love learning all the aspects of being an entrepreneur." Hayden wears a French-Terry Cocoon Top for Girls, $22, Old Navy and Cuffed Patchwork Skinny Jeans for Girls, $20, Old Navy. Hadley wears a Lace-Trim Top for Baby, $15.99, Old Navy and Jersey Leggings for Baby, $6, Old Navy. "I was born and raised in Hong Kong and moved to the U.S. with my family when I was 10. We lived in San Francisco and I've never moved! I went to high school and college here, studying marketing. After that, I dabbled in visual merchandising in luxury retail and later worked at an award-winning interior design firm. After having my first daughter, I decided to stay home and began to figure out the next step for my career. I think I've always had an inner entrepreneur in me, so I never thought twice about going back to a day job. I started researching the type of work I could do from home, and at the time blogging was on the rise and I decided to give it a try. My blog was gaining traction and naturally I was able to find a presence in the digital space and turned my blog into a business. I think it’s one of the best things I’ve done for myself, because not only did I gain a skill in digital media, but the people I’ve met and became friends with along the way have been the most valuable and rewarding part of this journey." Hadley wears a Lace-Trim Top for Baby, $15.99, Old Navy and Jersey Leggings for Baby, $6, Old Navy. Hayden wears a French-Terry Cocoon Top for Girls, $22, Old Navy and Cuffed Patchwork Skinny Jeans for Girls, $20, Old Navy. Jeanne wears an Open-Front Patterned Coat, $50, Old Navy; an Oversized Gauze-Front Shirt for Women, $18, Old Navy; and Women's Mid-Rise Rockstar Patchwork Jeans, $29.97, Old Navy. "I think so. I just know that anything I take on these days I need to be passionate about and it needs to enhance my professional and personal growth. I don’t think I have that luxury to experiment as much anymore. That’s not to say I’m not willing to try new things, but since time with my family is important, I have to be mindful on how I spend my time outside of them." French-Terry Cocoon Top for Girls, $22, Old Navy. "On weekends, we try not to over-schedule anything, so that we can really focus our time together being a family. While my work schedule is flexible, my work week can still be very long. I used to take Fridays off, but because of the intense schedule with my new business launch, I can only afford half days here and there. I do drop them off at school everyday and pick them up when my schedule allows. Other than that, my mother is a huge help with caring for my daughters while my husband and I run a busy work schedule during the week. I’m very lucky to have a close-knit family nearby, so it’s not hard to get help when I need it. My husband is also very supportive and hands-on. If I need to attend a function or schedule a last-minute meeting, it’s not a huge challenge for me." "My daughters love soupy meals, so we have a stock of soba noodles and quinoa macaroni in our cabinet for fast meals. We throw in spinach, chicken stock, and chicken or ground beef. 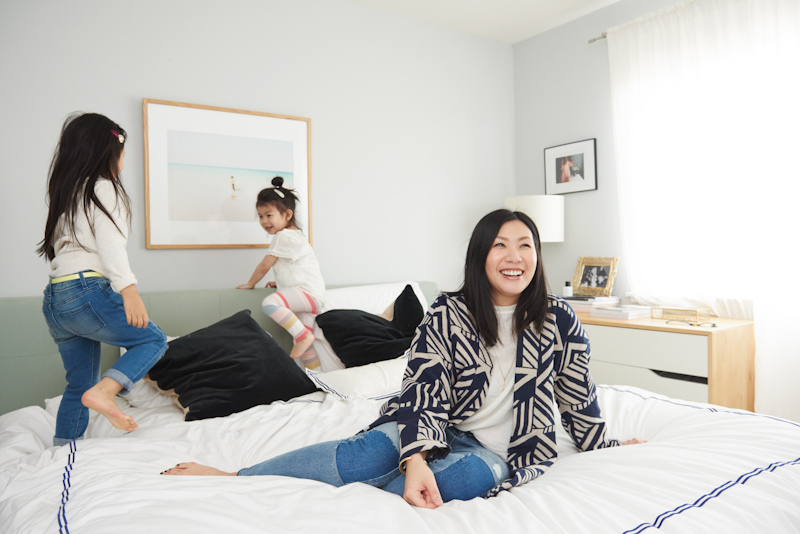 For my husband and I, we usually order something we cannot make ourselves, like sushi or pizza, and we sometimes order Munchery." 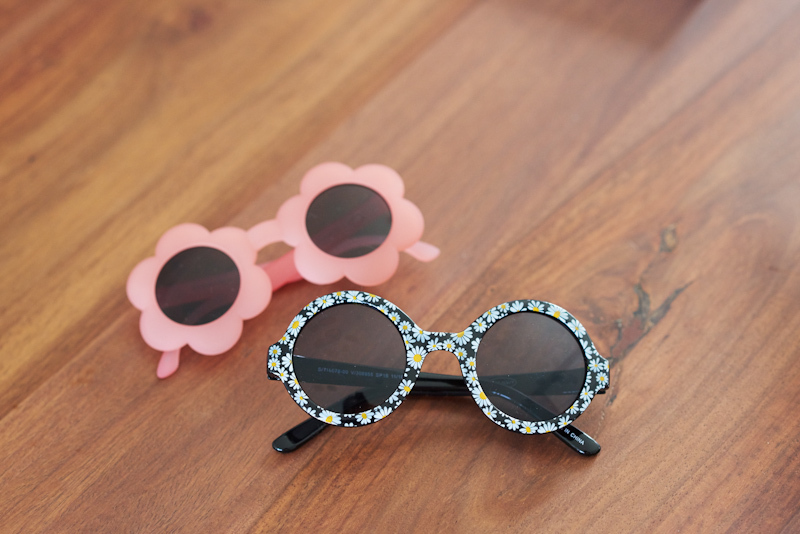 Flower-Shaped Sunglasses, $5, Old Navy and Flower Frame Sunglasses, $5, Old Navy. "I think the diversity we have in this city is pretty incredible. I want my daughters to learn that people come from all different backgrounds, ethnicities, and beliefs and I think S.F. is one of the best cities that would help expose my kids to that experience." "I wouldn't mind moving back to Hong Kong for a few years so that my daughters can get accustomed to the Chinese culture and language." "My girls love the California Academy of Sciences and Golden Gate Park. We’re also in Japantown often because they love sushi and ramen and they always pick up a book from Kinokuniya. We also like to hit up our neighborhood parks and their favorite pizzeria, Delfina." Jeanne wears an Open-Front Patterned Coat, $50, Old Navy and Women's Mid-Rise Rockstar Patchwork Jeans, $29.97, Old Navy. Hadley wears a Lace-Trim Top for Baby, $15.99, Old Navy and Jersey Leggings for Baby, $6, Old Navy. Hayden wears a French-Terry Cocoon Top for Girls, $22, Old Navy and Cuffed Patchwork Skinny Jeans for Girls, $20, Old Navy. For more on Jeanne and her family, check out her Instagram feed here.